authentic paint scheme and lettering. All of the doors can be opened. interior details and interior lighting. headlights change over with the direction of travel. 6 electrical pickups on the powered rail car. Both cars have two each general-purpose electrical sockets. cable for the electrical connection between the powered rail car and the control car. Length over the buffers 72.5 cm / 28-1/2″. DR Class VT 133 powered rail car with a control car in Era III lettering. This unit has an absolutely authentic paint scheme and lettering. All of the doors can be opened. 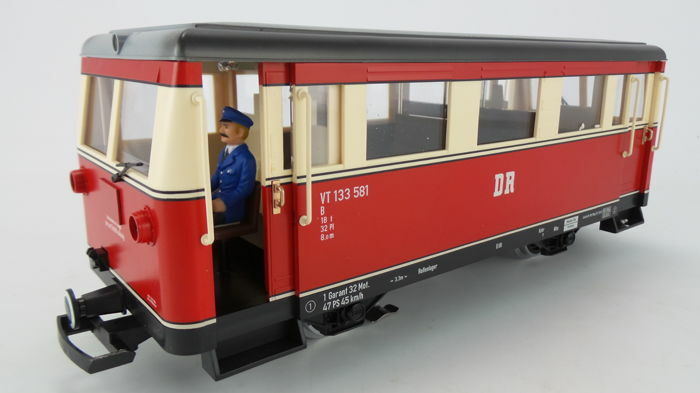 The powered rail car and the control car have interior details and interior lighting. The headlights change over with the direction of travel. The unit has 6 electrical pickups on the powered rail car. 2 axles powered. Both cars have two each general-purpose electrical sockets. 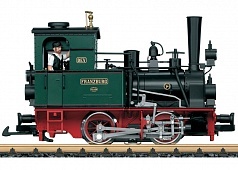 The model has an encapsulated drive with a powerful 7-pole Bühler motor, a built-in multi-train control system decoder, and a voltage limiting system. A cable is included for the electrical connection between the powered rail car and the control car.